We now have another favorite wedding venue...add Henry Ford Lovett Hall to the list. Samantha Cover from Thousand Words Photography (our favorite photography studio in Michigan) has talked very highly of Lovett Hall in her blog, and now we know why. Unfortunately it was rainy for most of the day so we didn't get to do a lot of shooting outdoors, but were not hard pressed to get great shots in doors. Since most of the couples that we work with are referred to us by their friends and family it is always good to see everyone again. 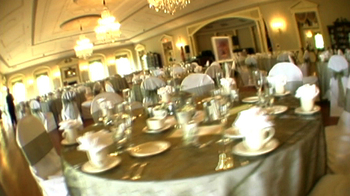 Prior to Tracy & Bree's wedding we had filmed, Tracy's brothers weddings. It is great to see everyone again and is a great honor to be trusted to capture all of the Chapman brother's weddings. Carrie Reid from The Henry Ford was very helpful and easy to work with. Thank you Carrie for working with us before the wedding, at the rehearsal, and all day at the wedding making sure everything ran smoothly.